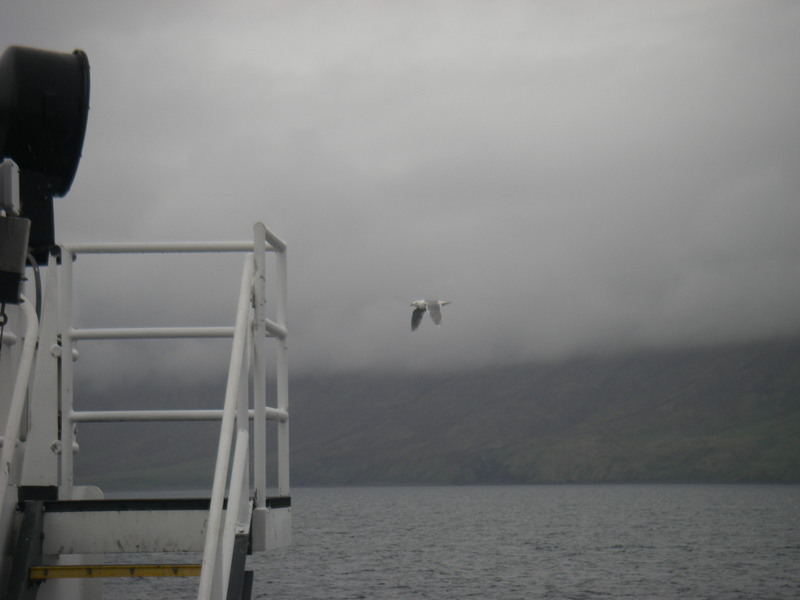 We have now completed 44 hauls in our survey and are on our way back to Dutch Harbor! 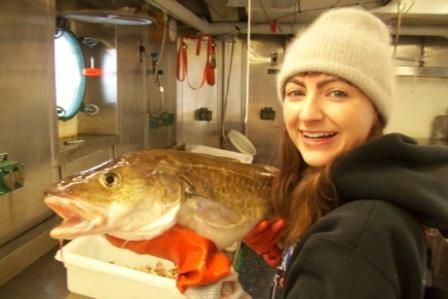 You can see a great map of our sampling area in the Bering Sea– click below. 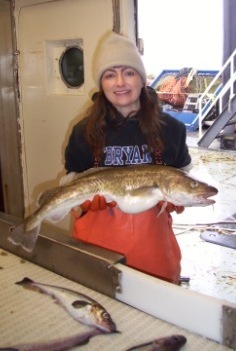 We caught approximately 118,474 pollock and they weighed 24,979.92 kg (= 25 tons)! 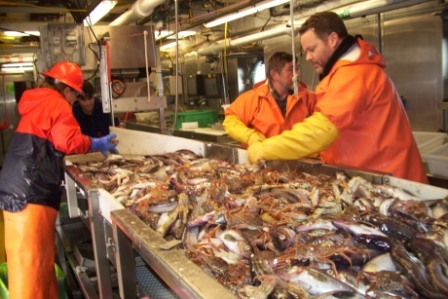 Last year’s official total allowable catch (called a quota) for all commercial fishermen in Alaska was 1.17 million tons! So, we only caught 25 tons/ 1,170,000 tons = 0.00002 = 0.002% of the yearly catch in our study. 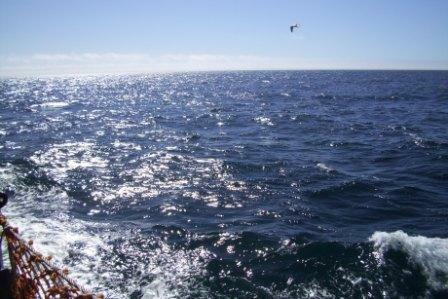 The estimated population of pollock in the Bering Sea is 10 million tons (10,000,000 T)! This means we caught only 0.00025% of the entire pollock population! So, as you can see, students, in the big picture, our sampling for scientific analysis is quite TINY! We measured 16,640 pollock lengths on the Ichthystick! 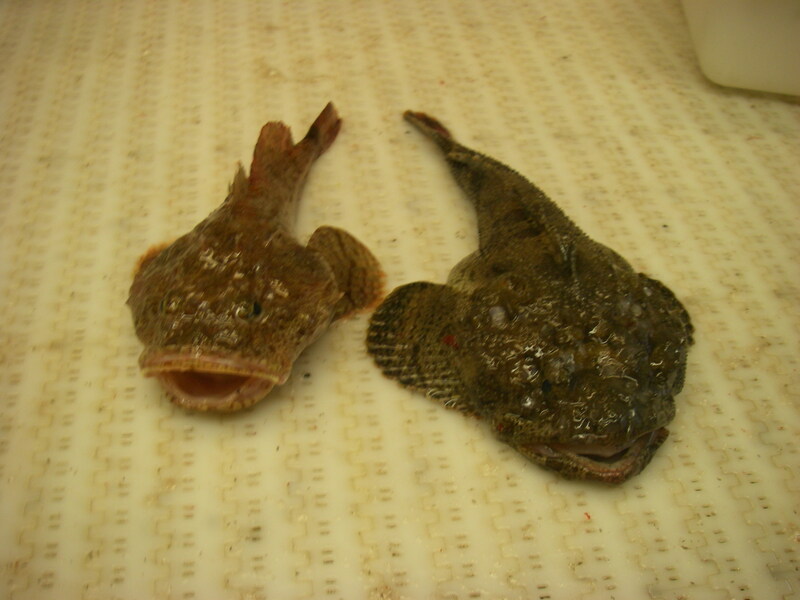 We have also had some exciting specimens on our bottom trawls. Remember, students, this simply means we drag the 83-112 net along the ocean floor. 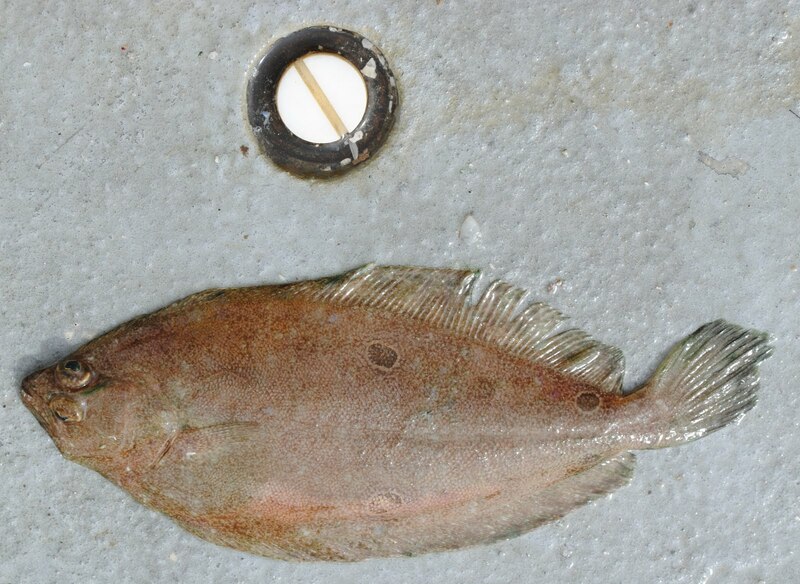 By sampling the bottom, we collect many non-pollock species that we would never see in the mid-water column. 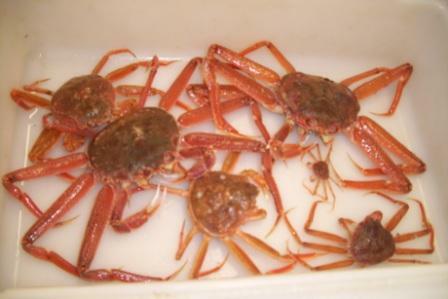 Next up, a very different sort: the Opilio Tanner Crab and the Bairdi Tanner Crab- both are known in the market as Snow Crabs! 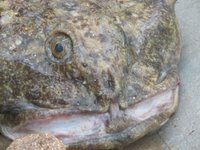 The one and only… Siberian lumpsucker! Yes, this specimen is full grown and no, we did not eat her, don’t worry! 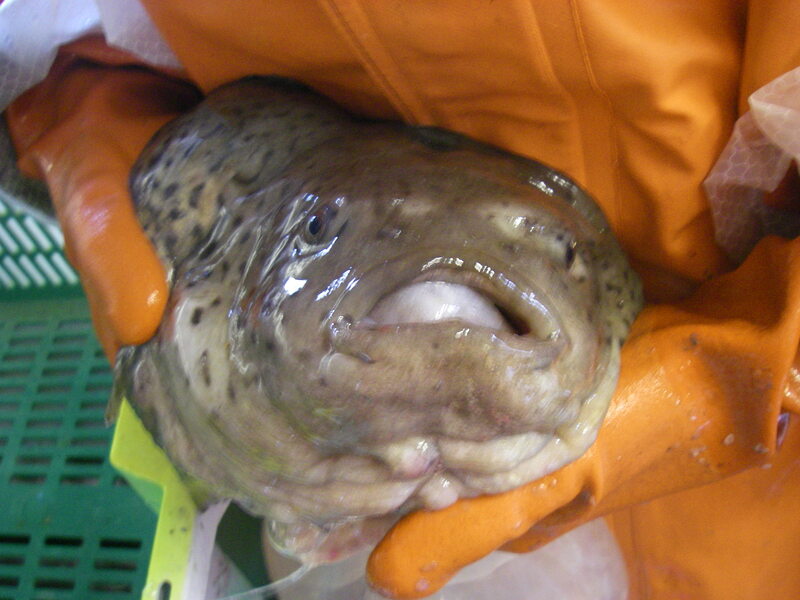 Followed by a slightly different type of lumpsucker! 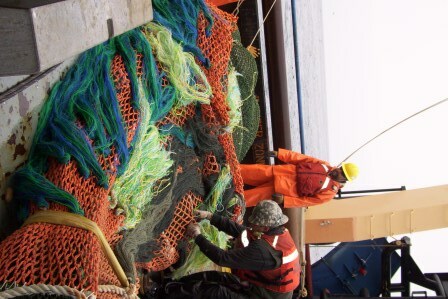 These types of nets require a lot of hands to help sort the species as they come down the conveyor belt! Oh yes, there is MORE sorting to be done! 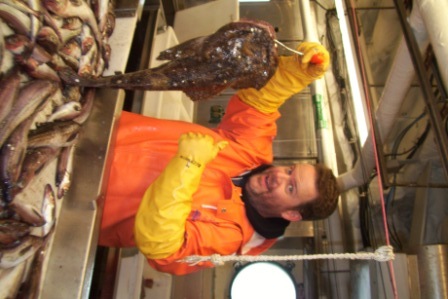 Here is fellow TAS (Teacher at Sea) Allan removing a … sculpin! 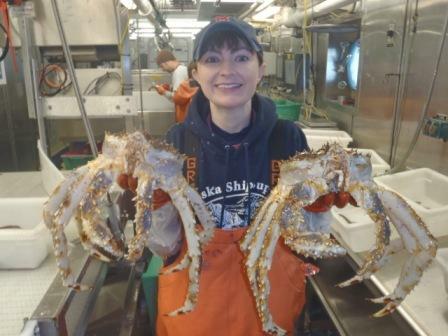 It wouldn’t be a proper trip to the Bering Sea without Alaskan king crabs, right? Interested in playing some online games from NOAA, students? Then visit the AFSC Activities Page here— I recommend “Age a Fish” and “Fish IQ Quiz” to get your started! Here is Rick… hard at work! Well, my time at sea has just about come to an end. This has been a wonderful experience, and I am very grateful to the NOAA science team (Taina, Darin, Kresimir, Rick, Anatoli, Kathy, and Dennis) for teaching me so much over these last three weeks. They have wonderful enthusiasm for their work and great dedication to doing great science! Not only do they work oh-so-very-hard, they are a really fun and personable group to be around! Many, many thanks to you all. Thanks also go to my Teacher at Sea partner, Allan Phipps, for taking photos of me, brainstorming blog topics, helping out processing pollock during my shift, and other general good times. It was great to have another teacher on board to bounce ideas off of, and I learned a great deal about teaching in Southern Florida when we discussed our respective districts and schools. 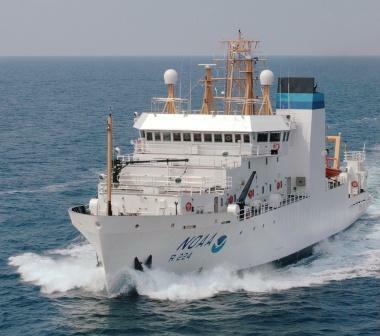 I would also like to thank the NOAA officers and crew aboard the Oscar Dyson. I have really enjoyed learning about your roles on the ship over meals and snacks, as well as many chats on the bridge, deck, fish lab, lounge, and more. You are a very impressive and efficient group, with many fascinating stories to tell! I will look forward to monitoring the Dyson’s travels from Boston online, along with my students. Special thanks to our Commanding Officer (CO) Mark Boland and Chief Scientist Taina Honkalehto for supporting the Teacher at Sea program. I know I speak on behalf of many teachers when I say there are many, many ways I will be bringing your work into the classroom, and I hope, helping recruit some of the next generation of NOAA officers and scientists! 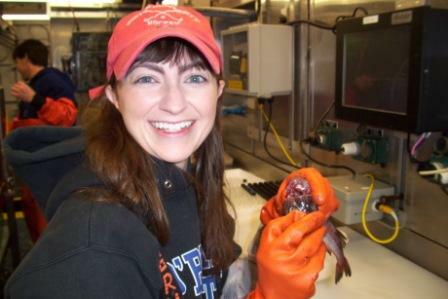 There are many pictures I could leave you with, but I decided to only choose two- one of a lovely afternoon on deck in the Bering Sea, and the other, of course, one more of me with a pollock head! Thank you very much NOAA and the Teacher at Sea program! 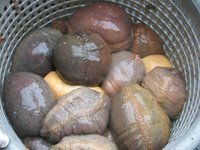 A little history and information about the ocean quahog is in order, since we’ve been spending most of our time the last few days collecting, counting, weighing, and measuring them (along with a few other things we dredge up – more about those later). The ocean quahog, or Artica islandica, is a marine bivalve member of the phylum Mollusca. 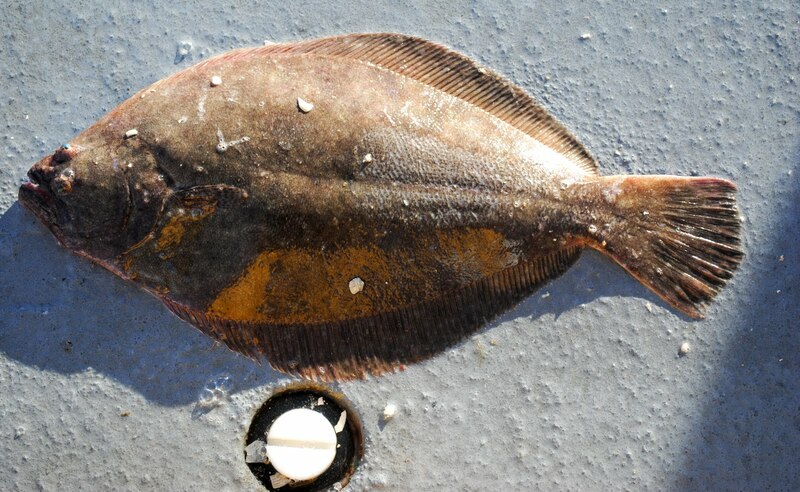 It is native to the North Atlantic (where we are right now) and is commercially harvested as a food source. The ocean quahog lives in deeper water than the more common clam (the ones you can dig up along the beach) and are collected in much the same way as we are doing on the Delaware II, by dredging the bottom, rinsing off the mud, and throwing away all the other things brought up. 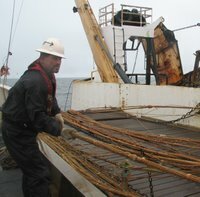 We bring up any where from one to three baskets of ocean quahogs with each dredge. One of the unique characteristics of the ocean quahog is its longevity. They are known to live over 100 years. They are extremely slow-growing and as adults, may take years to add any measurable length to their shells. Both water temperature and population density appear to play a role in their growth. 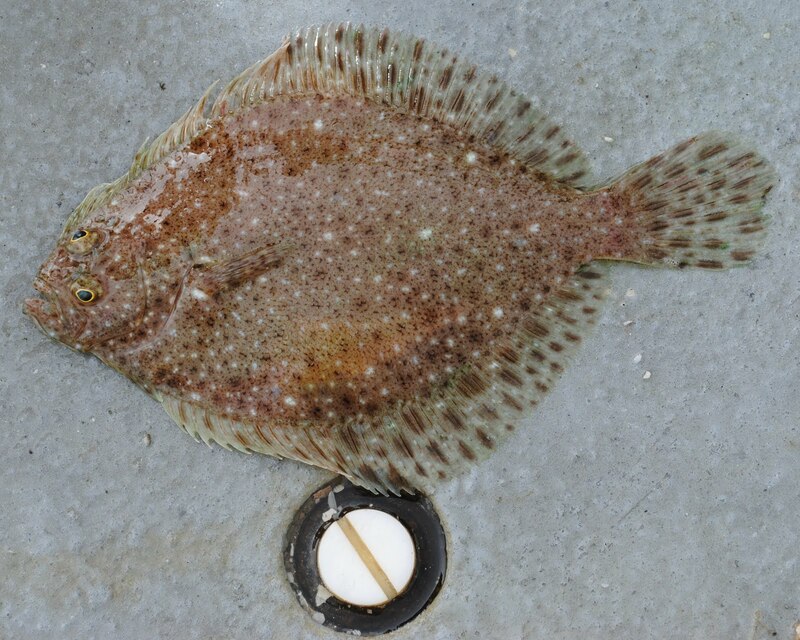 From previous NOAA studies, some of the fastest growing populations occur at the Georges Bank region off the coast of Massachusetts. 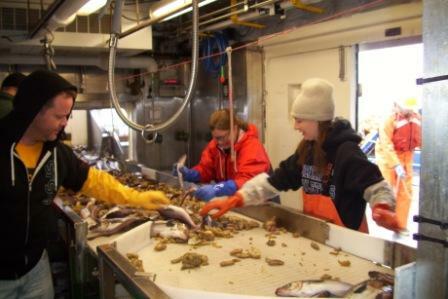 The National Marine Fisheries Service (NMFS) uses the data collected from this survey to advise policy makers on the best way to protect and ensure the survival of the ocean quahog populations. So what do we know so far about the ocean quahog’s populations? 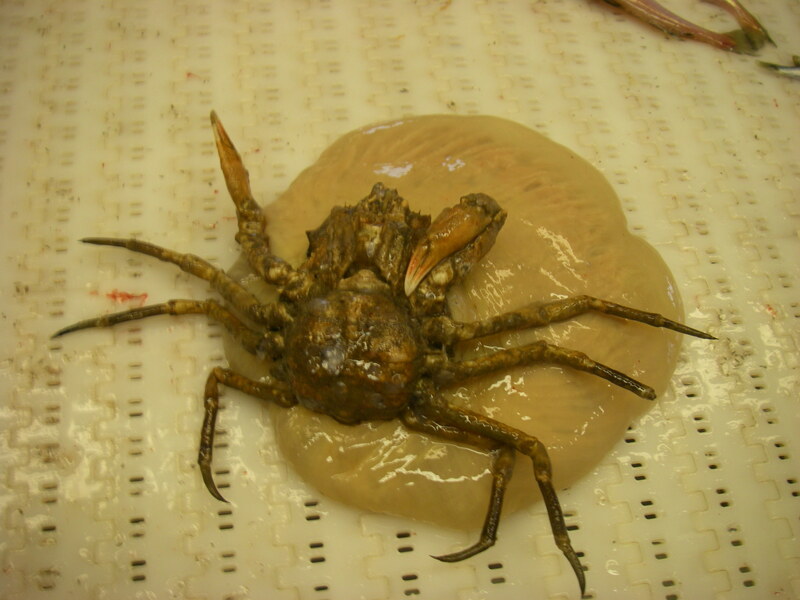 Besides the fact that they grow slowly, we know they are suspension feeders of phytoplankton and they themselves are food for a variety of other invertebrates including crab, sea stars, urchins, and some fish such as cod. 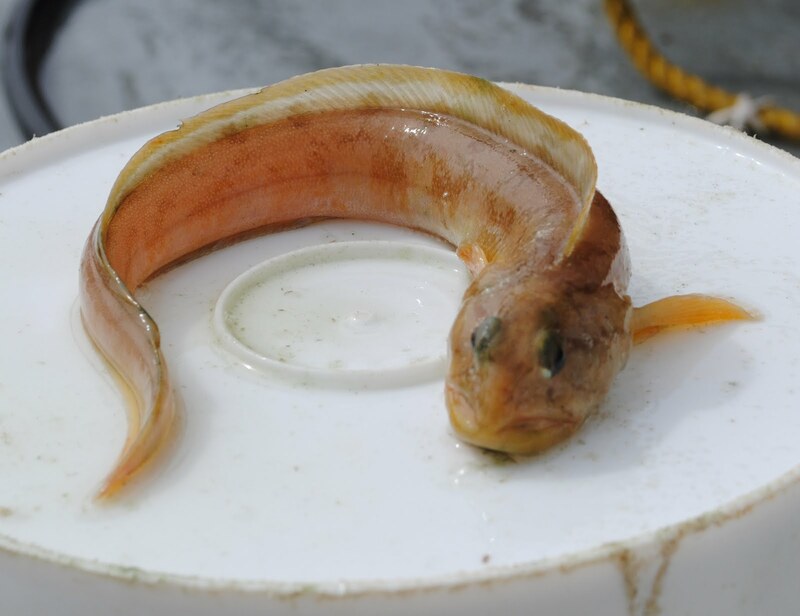 The dredging process damages some ocean quahogs making them susceptible to other predators such as sculpin, skates, and flounder. 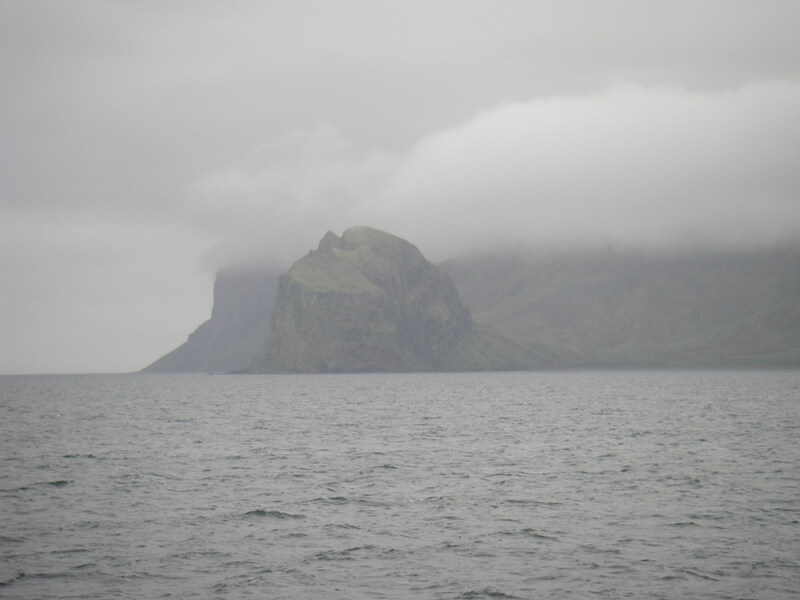 Every three years the populations in the Northern Atlantic are surveyed and past results indicate the populations are stable despite the dredging methods of collection. 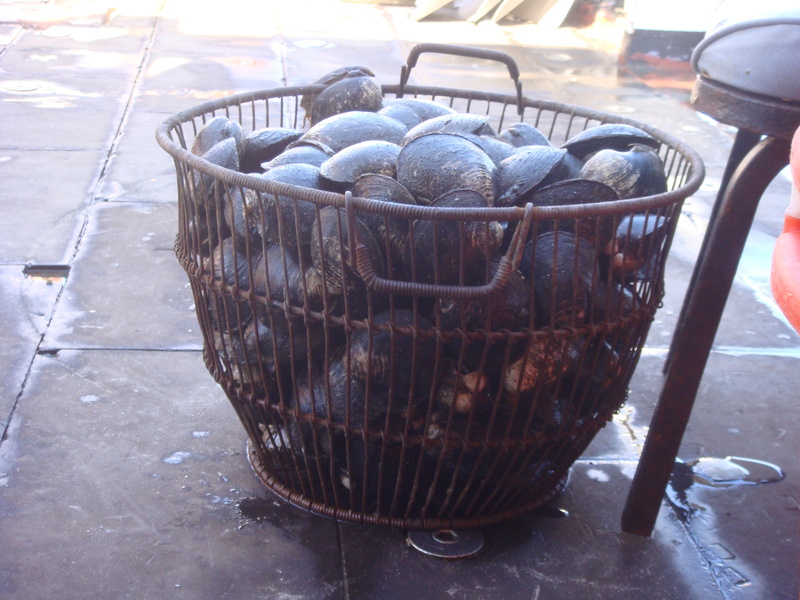 The ocean quahog is not considered endangered at this time and is not considered overfished. The lightning storm was beautiful to watch – the only thing missing was the thunder! Our ship never stops so the engines run continuously, making hearing anything on deck almost impossible. We’ve brought up some incredibly interesting animals – some I’ve never seen or heard of. 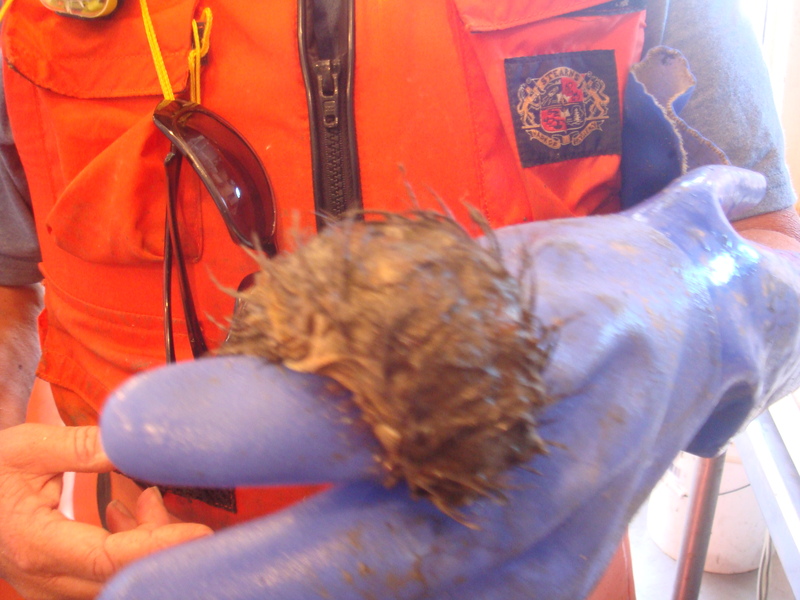 For example, we’ve brought up numerous “sea mouse” samples. They are actually carnivorous worms who live on the ocean floor and are covered with long hair-like threads, or setae. The ones we’ve brought up are 4-6 inches long. Creepy! We are currently at survey site 229 which for you students translates to trial number 229. No more complaining to me about having to repeat your experiment 25 times! Today has been the calmest evening since I boarded the Oscar Dyson. The night shift did not fish at all, which meant that I basically had an evening off! Even the evenings we have fished have been relatively calm. It takes us about an hour to an hour and a half to process a haul of fish, and up to this point we average about one haul per night. That gives me quite a bit of down time! When I am on shift, that down time is usually spent in one of two places. 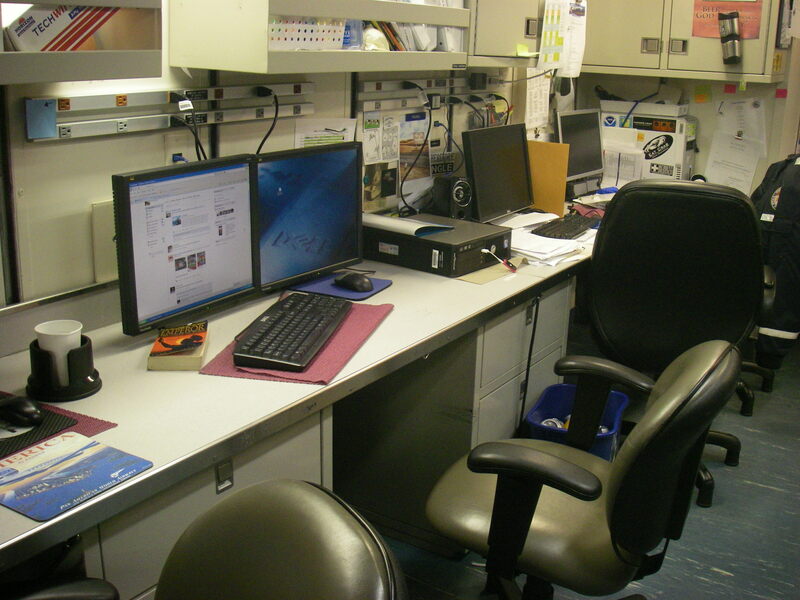 The first spot is the computer lab in the acoustics room. This is the room where we wait for the haul to be brought in. I write the logs, lesson plan, check emails, and surf the web during quiet times. This is the lounge. The cabinet under the TV has over 500 movies, and a movie is usually playing when I walk in. Behind the couch is a large bookshelf with several hundred books, so I have done a fair amount of pleasure reading as well. When I am not sitting in one of these two places, I am usually running around the ship with my camera taking nature photos. Below are the best nature photos of the past three days. 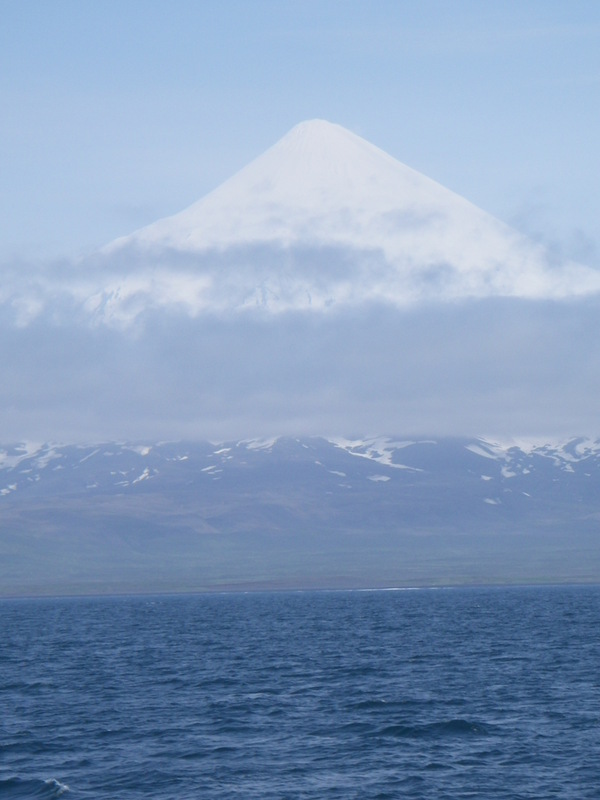 One of the coolest things about the Aleutian islands has to be the number of volcanoes that can be seen. This is the one on Unimak Island. A second picture of the same volcano. This is just a cool rock formation off of the coast. The Oscar Dyson has been hugging the coast the entire trip, which has been great for scenery. 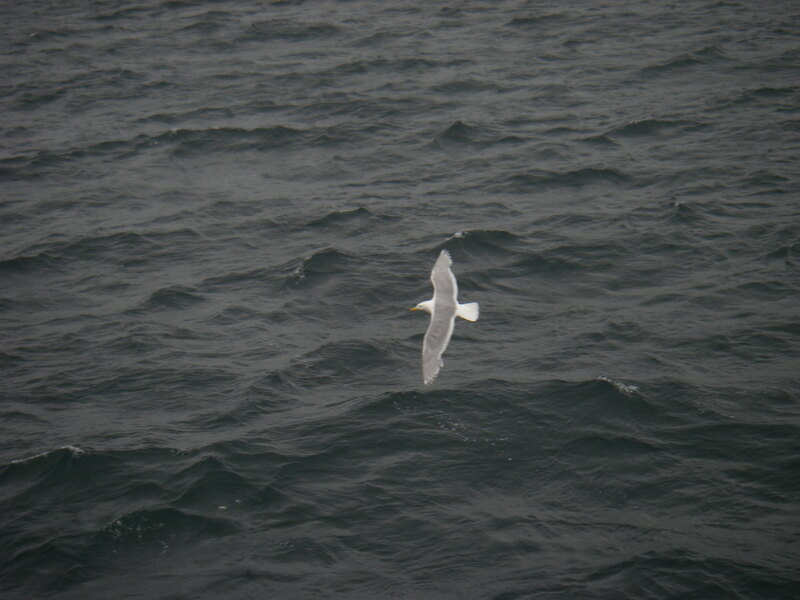 A gull skims the water by the Oscar Dyson. We resumed fishing today! These trawls brought in quite a few species that I had not seen before, along with the ever plentiful pollock. The net, filled with fish! Jason waits for the net to load the fish onto the conveyor belt. 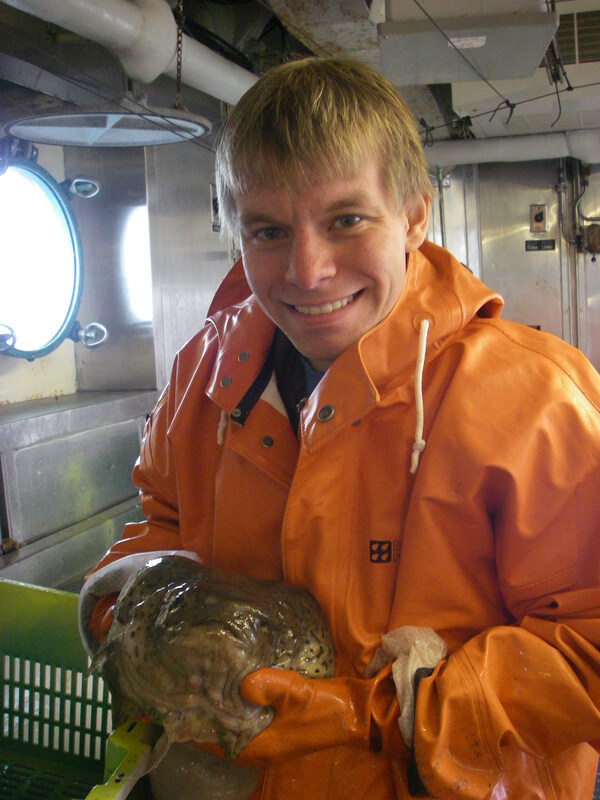 Here, I am separating the arrowtooth flounder from the pollock. 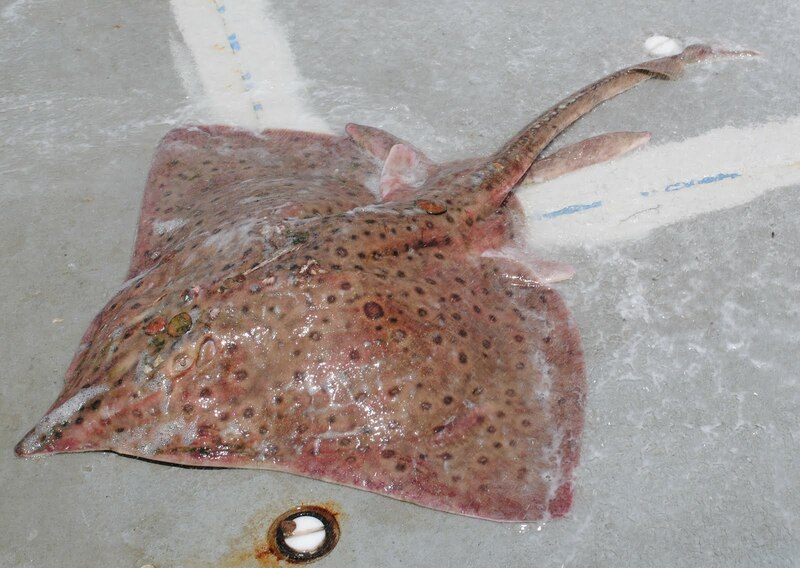 We managed to catch a skate in the net! 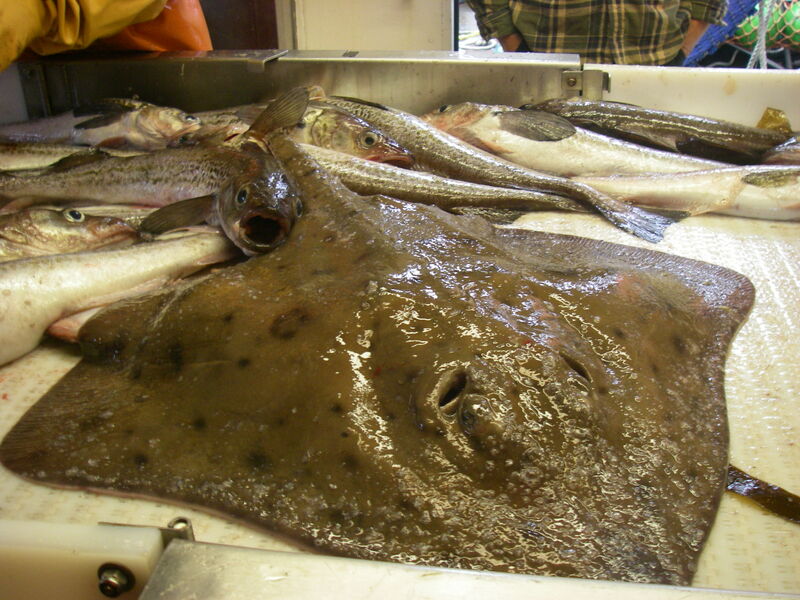 Skates are very close relatives to sharks. We quickly measured it and then released it into the ocean. 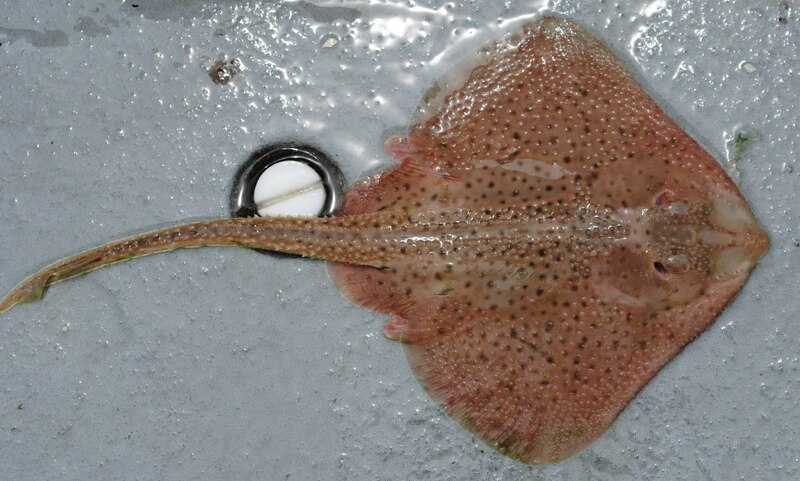 A second photograph of the skate. 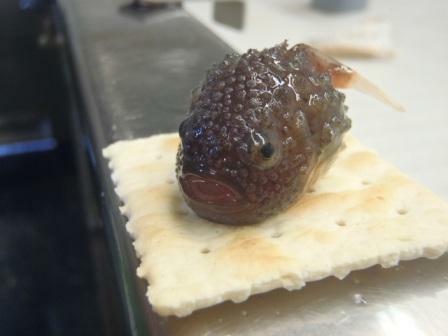 Do you remember the little lumpsucker from a few posts back? This is what an adult looks like! The lumpsucker was slimy! I tried to pick it up with my bare hands, and the slime gummed up my hands so that I couldn't pick it up! Even with gloves designed for gripping fish I had trouble holding on. 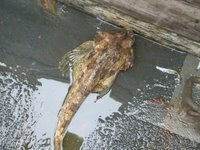 This fish is called a sculpin. I finally saw a crab! None of us know what was attached to it, but the scientists believe that it was an anemone. This is a starfish the net pulled up. There is no Science and Technology Log with this post. Today’s question comes from James and David Segrest, who are two of my homeschool students! Q. What do you eat while you are on your adventures? Do you get to catch and eat fish? The food is great! Our chef has a degree in culinary arts, and has made some amazing meals! I wake up at 2:30 pm for my 4 pm to 4 am night shift, and usually start my day with a small bowl of oatmeal and a toasted bagel. At 5 pm, about two hours after breakfast, dinner is served, and I will eat a huge meal then too. Every meal has two main courses, a vegetable, a bread, and dessert. We have had a wide variety of main courses which have included bratwurst, steak, gumbo with king crab, fish, chicken parmesan, spaghetti with meatballs, and others! 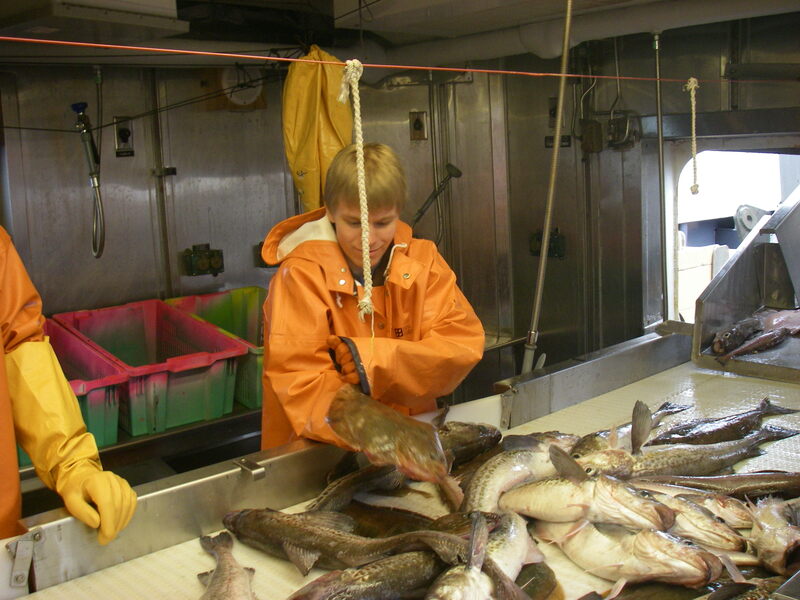 We will often eat some of the fish we catch, usually salmon and rockfish since those provide the best eating. The salmon disappears to the kitchen so quickly that I have not actually been able to get a photo of one! 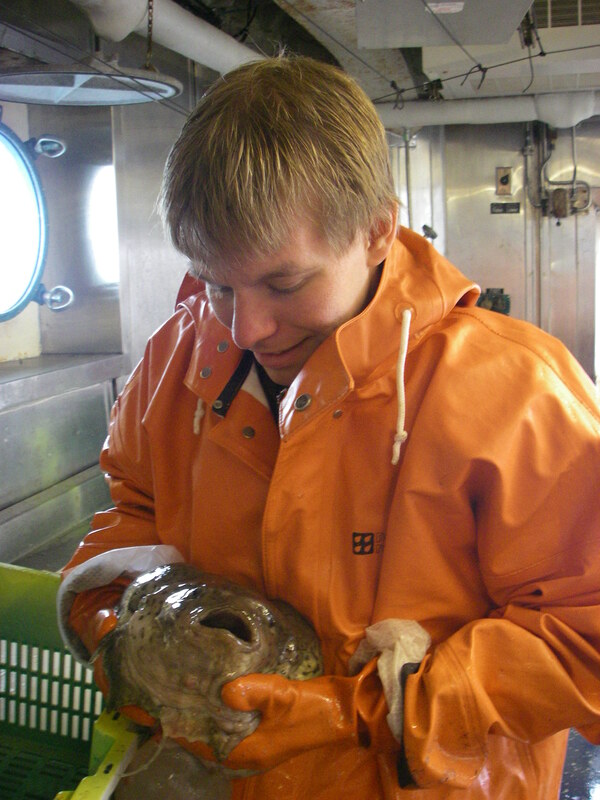 We have not caught a halibut in the trawl net yet, otherwise we would likely have eaten that as well. Yum! 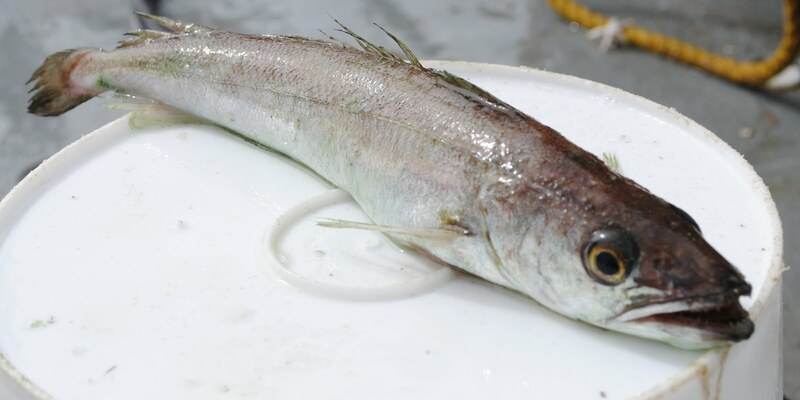 We have not yet eaten pollock, as it is viewed as being a much lower quality fish compared with the rockfish and salmon. I’m out of questions, so please email me at jmoeller@knoxville-zoo.org with those questions please! 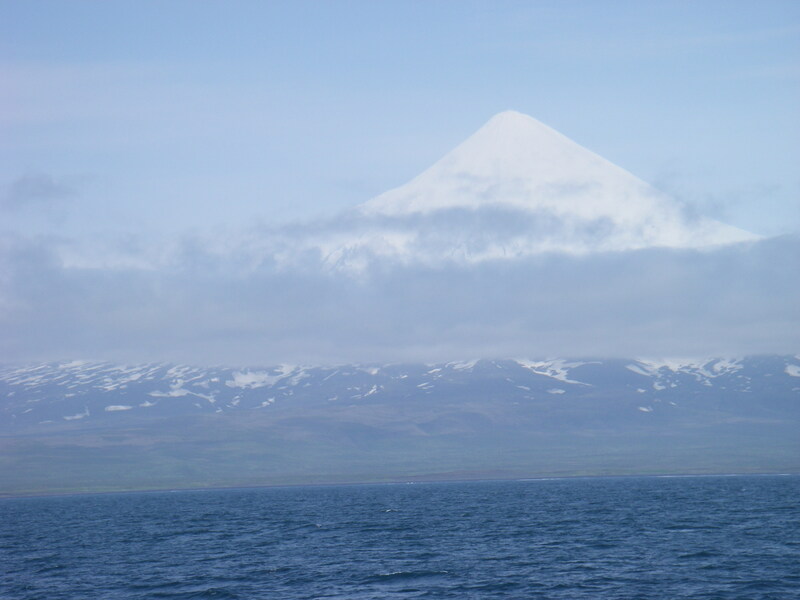 NOTE: We will arrive in the port of Dutch Harbor, Alaska on June 20. As the project draws to a close, I would like to evaluate how effective it was. There is a link to an electronic survey. I would like to ask students, teachers, parents, and other visitors to the site to take a few moments to let me know what you think of this idea. The survey is all electronic and only takes a minute or two to complete. Thank you in advance for your time. Click here to access the survey. 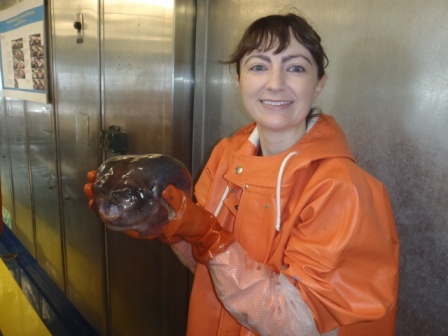 By now, you have met many of the interesting people aboard NOAA ship MILLER FREEMAN. There are three groups of people aboard these ships. The officers on the ship are part of the NOAA Corps. This is a uniformed service of the United States consisting of about 300 officers who complete rigorous training and hold ranks, like ensign, or commander. They are in charge of ships operations and stand watch on the bridge. 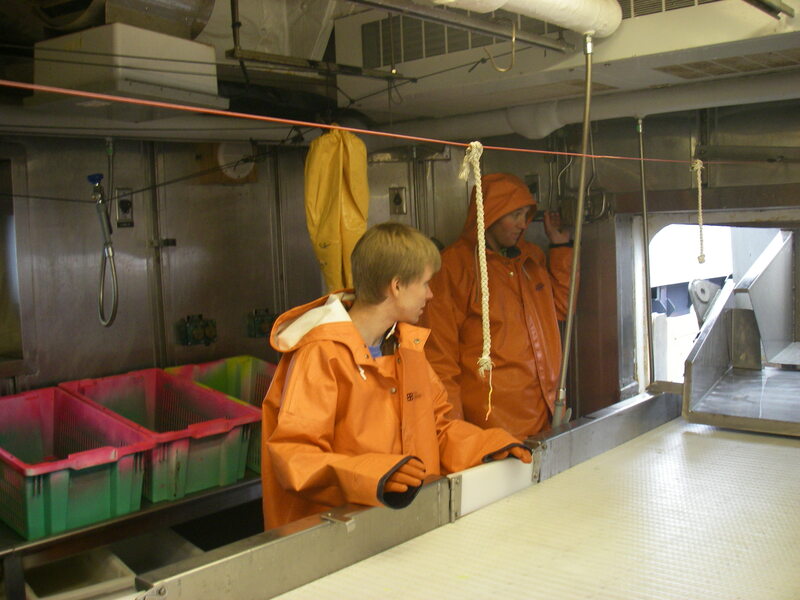 The scientists aboard are mostly from NOAA research labs, like the Alaska Fisheries Science Center in Seattle. Many of the other members of the crew are civilian wage mariners. These are professional sailors who handle many of the day to day operations of the ship. 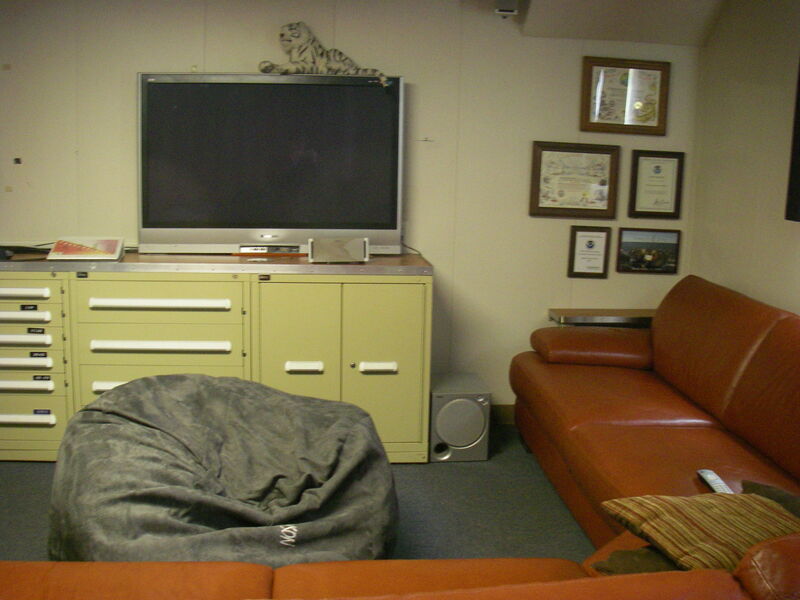 Some, such as Chief Engineer Bus, have made their home on this ship for close to 30 years. Other sailors are contract workers who come aboard for a few months, go home and take a break, then join the crew of another ship for a different sort of cruise. Sometimes they are on research vessels, sometimes they are on freighters, sometimes they are on tankers. Today, lets meet able-bodied seaman, or AB Michael O’Neal. Click each question to listen to the answer. 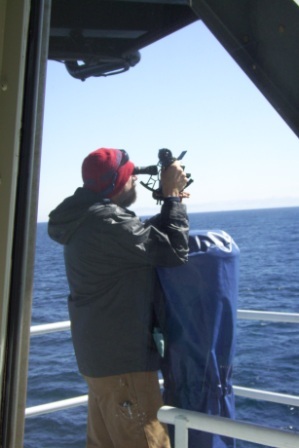 What do you do on board the NOAA Ship MILLER FREEMAN? Tell us about what you have done and where you have gone on some of the other ships you have been on. Where are some of the other jobs you have had at sea? What does it take to be an able-bodied seaman? Smile! 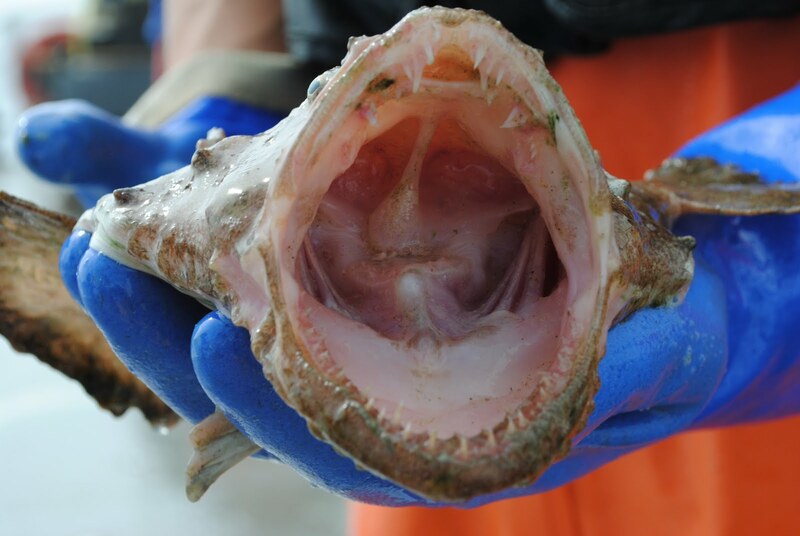 This is a big mouth sculpin. 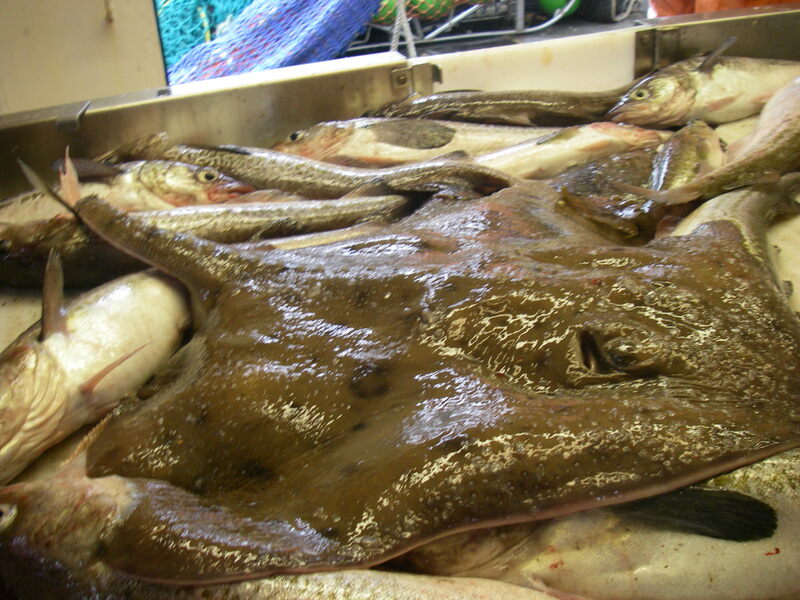 We had another in a series of amazing bottom trawls last night. 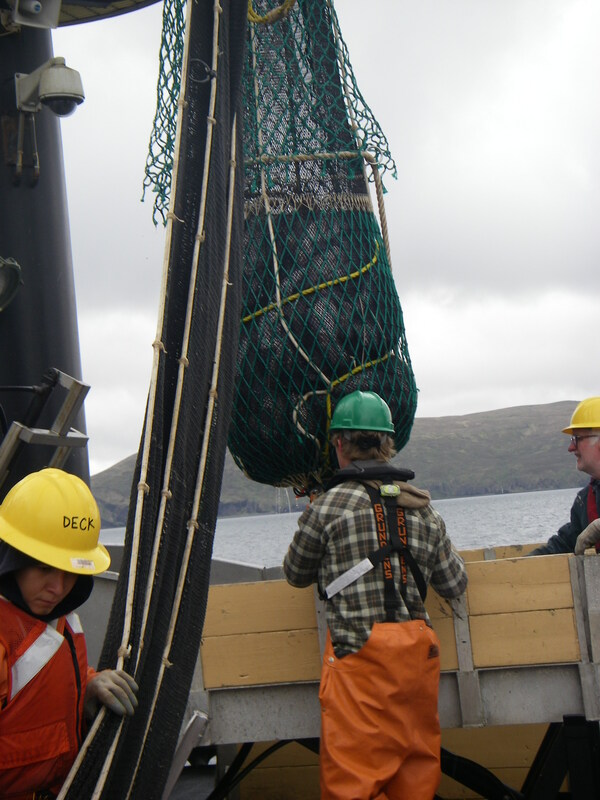 When the nets trawl along the bottom out here, some of the most interesting creatures of all get swept into our nets. Creatures that live on the bottom are often stranger looking for a few reasons. They are adapted to blend into the bottom so that predators cannot see them. They often wind up looking like rocks or plants as a kind of defense. They are also adapted to an environment with higher pressure and less light than the surface. 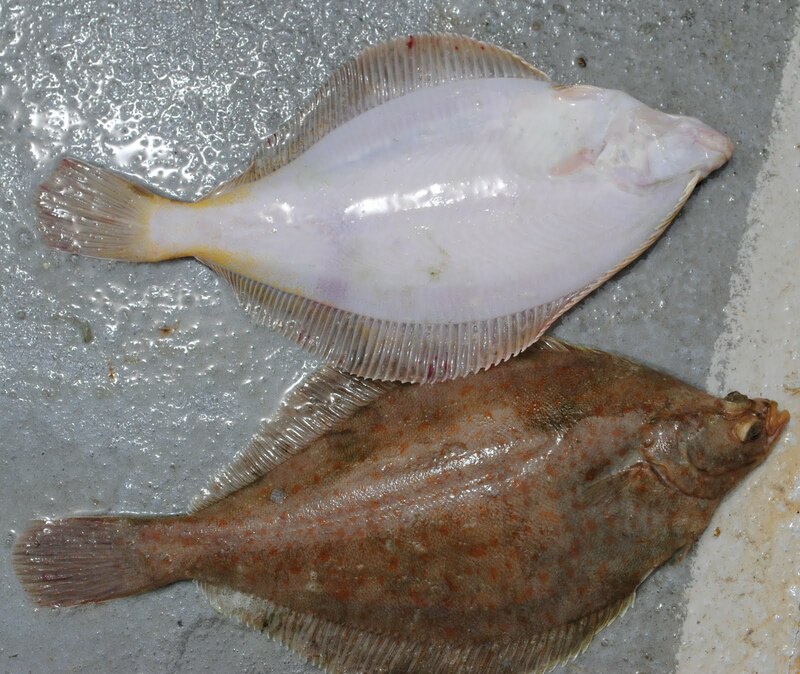 Some of their adaptations can also make them look very different from other fish. Since they don’t have to worry about predators below them, these fish may be flat and have both their eyes sticking up. These creatures often do not need to be fast swimmers, since their defense is to blend into the environment rather than swim away when predators approach. The basket of sea cucumbers was one of the strangest things I’ve seen so far. These sticky blobs are not plants. They are sea creatures that live on the bottom of the sea and sift through the sand or water to find food. There are several different kinds of sea cucumbers in this basket. Can you see the different types? 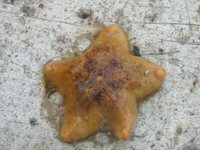 Mud stars, on the other hand, are soft and sticky, not like the sea stars we have at home. 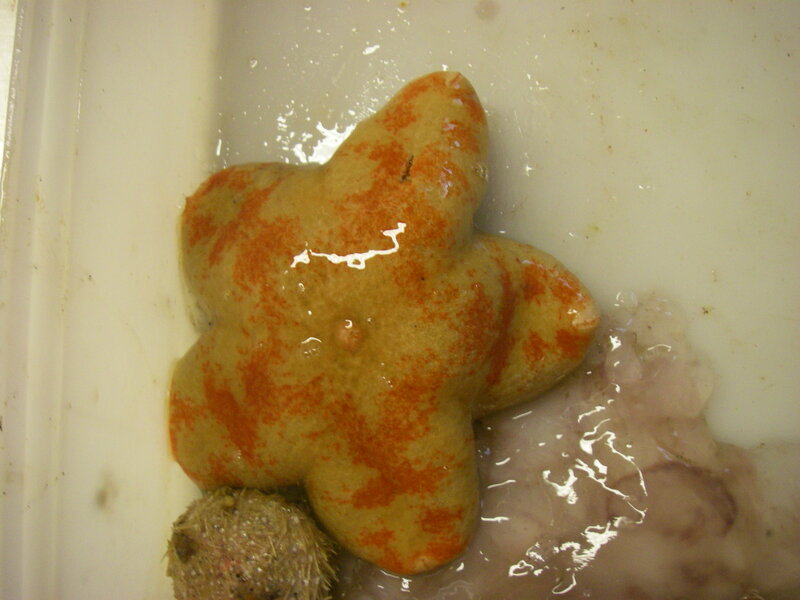 It may be called a mud star, but I think looks like Patrick from Sponge Bob. 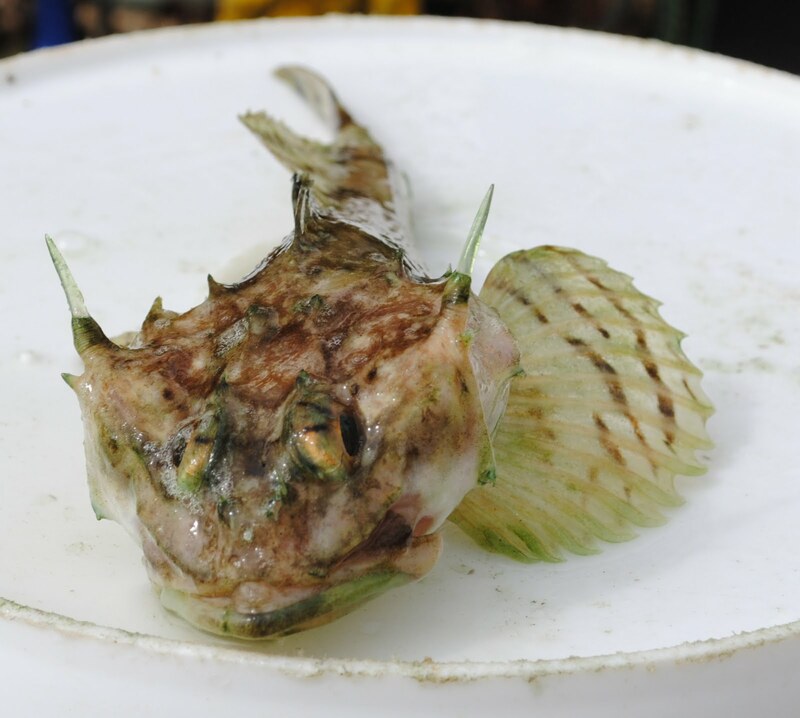 Another kind of sculpin with large fins that look like the wings of a butterfly, called a Butterfly sculpin. Now that you have seen some of the different jobs aboard NOAA Ship MILLER FREEMAN, if you were on a ship, which job would you prefer? Write me a comment on the blog and let me know! Look at the movements of the ship described above. When the ship drives into the wind and waves, sailors call it a corkscrew motion. Can you think why? A corkscrew motion occurs when the ship is struck by waves in such a way that it moves in several motions at once. In other words, it may pitch, roll, surge, and sway all at the same time. I’m getting a funny feeling in my stomach just thinking about it! Sorry that I left off the link from Friday where you can see the position of the ship. Here it is. Fair warning, the site was down for most of today, so if it does not work, just try again later. After we put in to port, I’ll have a day or two in Dutch Harbor to look around, before I can get a flight in to Anchorage. After that, I’ll be visiting some friends and family out west before I head back east. Thanks for writing.